So you want to be a Nozbe Ninja? How about we start with the basics. Whether you’re experienced or completely new to the productivity scene, everyone begins with their White Belt. There is no way around it. 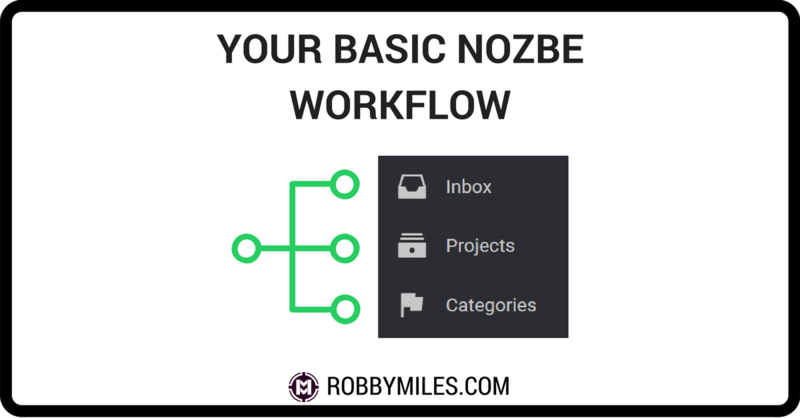 So start at the beginning by creating a basic Nozbe workflow. To begin, get a copy of David Allen’s Getting Things Done if you don’t have one already . You can find used copies everywhere, so you can pick one up for a couple of dollars. This book will give you the basic framework behind how Nozbe works. In this post, I’ll show you how to capture and process all the tasks that enter your brain each day to get ideas out of your head and organized so you can take action. This should go without saying, but you’re going to need a Nozbe account to make this work. If you don’t have an account yet, sign up for a free account here. Any time something comes to mind that might have a task attached to it you need to add it to your trusted system. This can be anything from picking up groceries to that brilliant idea you had in the shower. The idea is to get it out of your head before yo have a chance to forget it. Luckily Nozbe has a great Inbox feature. Add a task to your Inbox by clicking the + in the lower right corner. Or to quickly add a task to your Inbox from any Nozbe screen tap the space-bar. This will bring up a bar like the one in the picture below. Type in your task. If you tap Enter, the task will be added directly to your inbox for you to sort at a later time. It’s quick and feels natural. To save time now, you can add your task directly to different Projects and Categories by using # to assign specific attributes. Let’s be honest, you probably don’t want to have everything in one giant inbox. You’d probably be doing just as well trying to remember everything. Like other task managers out there, Nozbe uses Projects to help you organize similar tasks. Any task that has three or more steps is turned into a project in GTD. That’s probably a little overboard, but the idea is simple: keep tasks actionable. When you’re ready to clean out your Inbox, open your Projects so you can easily drag tasks into the proper project (works only for desktop and web, sorry mobile). This will save you a ton of clicks. Or you can click on the task, and then assign a project in the menu like Task 4 in the video below. Later, you can learn to set up your projects with labels, to easily be able to sort and find tasks. Categories are used in Nozbe as another way of sorting tasks. Think of it this way: Projects are vertically aligned and Categories are horizontally aligned. A task can only belong to one project, but can have any number of categories. Categories can be used to group tasks by type of action (phone calls) or location where a task should be completed (work). Some people swear by using a ton of Categories in their GTD system. But honestly, having too many Categories unnecessarily complicates your system. Begin by keeping things simple and streamlined. Keep your Categories limited and only use them for the tasks you’ll regularly batch. There you have it. Three simple steps to get your ideas out of your head, into a project, and ready to batch to get it done efficiently. Use Nozbe’s Inbox to dump all your ideas so you never forget tasks again. Move tasks to Projects to keep things organized and easy to find. Batch and sort tasks using Categories. Want to learn advanced ways to use Nozbe but only have 30 minutes? Check out Jump Start Nozbe and I’ll teach you everything you need to know.